Plywood is a widely recognized engineered wood-based panel product that has been used in Canadian construction projects for decades. Plywood panels manufactured for structural applications are built up from multiple layers or plys of softwood veneer that are glued together so that the grain direction of each layer of veneer is perpendicular to that of the adjacent layers. These cross-laminated sheets of wood veneer are bonded together with a waterproof phenol-formaldehyde resin adhesive and cured under heat and pressure. Plywood panels have superior dimensional stability, two-way strength and stiffness properties and an excellent strength-to-weight ratio. They are also highly resistant to impact damage, chemicals, and changes in temperature and relative humidity. Plywood remains flat to give a smooth, uniform surface that does not crack, cup or twist. Plywood can be painted, stained, or ordered with factory applied stains or finishes. 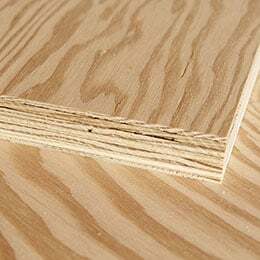 Plywood is available with squared or tongue and groove edges, the latter of which can help to reduce labour and material costs by eliminating the need for panel edge blocking in certain design scenarios. Plywood is suitable for a variety of end uses in both wet and dry service conditions, including: subflooring, single-layer flooring, wall, roof and floor sheathing, structural insulated panels, marine applications, webs of wood I-joists, concrete formwork, pallets, industrial containers, and furniture. Plywood panels used as exterior wall and roof sheathing perform multiple functions; they can provide resistance to lateral forces such as wind and earthquake loads and also form an integral component of the building envelope. Plywood may be used as both a structural sheathing and a finish cladding. For exterior cladding applications, specialty plywoods are available in a broad range of patterns and textures, combining the natural characteristics of wood with superior strength and stiffness properties. When treated with wood preservatives, plywood is also suitable for use under extreme and prolonged moisture exposure such as permanent wood foundations. Plywood is available in a wide variety of appearance grades, ranging from smooth, natural surfaces suitable for finish work to more economical unsanded grades used for sheathing. Plywood is available in more than a dozen common thicknesses and over twenty different grades. Unsanded sheathing grade Douglas Fir Plywood (DFP), conforming to CSA O121, and Canadian Softwood Plywood (CSP), conforming to CSA O151, are the two most common types of softwood plywoods produced in Canada. All structural plywood products are marked with a legible and durable grade stamp that indicates: conformance to either CSA O121, CSA O151 or CSA O153, the manufacturer, the bond type (EXTERIOR), the species (DFP) or (CSP), and the grade. Plywood can be chemically treated to improve resistance to decay or to fire. Preservative treatment must be done by a pressure process, in accordance with CSA O80 standards. It is required that plywood manufacturers carry out testing in conformance with ASTM D5516 and ASTM D6305 to determine the effects of fire retardants, or any other potentially strength-reducing chemicals.